For years, people have been writing in to rave about Norwex. Mind you, most of these were not people who were selling Norwex, they were just people who had purchased the product and loved it. After trying the products myself, I understood why everyone is so excited about Norwex! 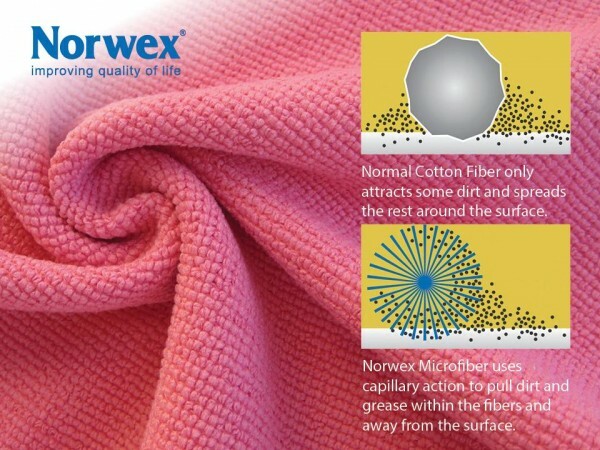 What’s so special about Norwex? Well, for one, it eliminates the needs for dozens of cleaning products. You can clean just about anything and everything with one microfiber cloth and water. This saves you money — especially if you’re investing in expensive all-natural cleaners — and it simplifies things. Secondly, Norwex products clean really, really well. How do I know? Well, because I’ve been using them religiously for the past two years and I’ve seen the results firsthand. For example, someone in our family spilled a quite a bit of liquid Mary Kay foundation in the front seat of our car (yes, don’t ask — but if you have kids, you probably understand how crazy things like that happen sometimes! ). Jesse and I were trying to scrub it up with rags — and it was taking a LOT of elbow grease with little to show for the effort. Finally, we broke out the Norwex cloth. We were shocked at the difference it made! Even Jesse kept commenting, “Where did you get this thing? It’s amazing!” Within minutes, the front seat of the car looked good as new. Without Norwex, we’d probably still be trying to scrub up the make up spill. Not only do Norwex products clean well, but they make cleaning fun. It’s just plain cool to clean with water and have it work so well. And the polishing cloth leaves everything sparkling. In fact, you get a little addicted to the sparkling results… and then you can’t stand it when it’s not shining! Today, Norwex consultant Ilyssa is generously giving away Norwex Scrubby Starter Pack (this pack includes a Scrubby Corner Cloth, an Enviro Cloth, a Window Cloth and a Cleaning Paste) to four readers. I love these products — especially the Cleaning Paste and the Scrubby Corner Cloth. They are pricey, but they will be used again and again and again. The Enviro Cloth cleans your home with only the use of water! The average American uses between 1.5 and 2 rolls of paper towels a week. If your family uses this many paper towels and you switch to Norwex, even if you typically pay around $0.50 per roll with coupons, the Enviro Cloth will pay for itself in about three months! The Window Cloth shines windows, jewelry, TVs, and more with only the use of water as well. Both products are lined with silver and this gives them the antibacterial cleaning. 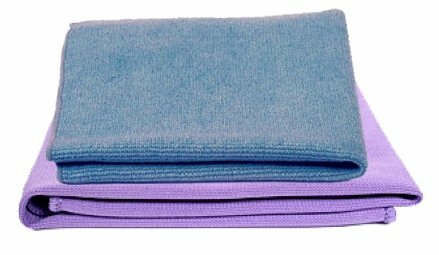 The Scrubby Corner Cloth: The popular Norwex Microfiber Cloth is paired with a special scrubby pocket so you can tackle the tough messes! This cloth is handy for reaching into corners to get stubborn dirt and debris, it leaves stove tops, counters and grills clean and sparkling. Cleaning Paste: This environmentally friendly paste that cleans, polishes and protects chrome, stainless steel, aluminum, porcelain and similar surfaces in one application. Permanent Marker from Surfaces: Dampen either your Scrubby Corner Cloth or your Enviro Cloth and swipe over the Cleaning Paste a few times. Gently scrub the marked area and watch the marker disappear! Wipe clean with an unused part of your cloth. Stainless Steel: Dampen your Scrubby Corner Cloth or Enviro Cloth. Swipe through the Cleaning Paste a few times. Wipe down your Stainless Steel, with the grain. Wipe with a clean portion of your cloth. Follow up with the Window Cloth to get a high sheen! Windows (even car windows! ): Wipe the window with a damp Enviro Cloth. Dry with your Window Cloth. 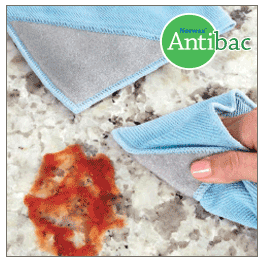 Granite Counter Tops: Wipe down with a damp Enviro Cloth. Dry with a Window Cloth. Would you like to win a free Norwex Scrubby Starter Pack? To enter to win, just click on the graphic below and type in your name and email address. Four winners will be chosen and posted early next week. This giveaway ends Sunday, June 8, at 11:59 pm, CST. « Frugal Fun: Free Krispy Kreme doughnuts!! Norwex ALMOST makes cleaning fun! Thanks ,sound like a great product. I just heard about Norwex this week and I’m going to a party next week. What would some of you recommend buying first? One of the cloths? I would buy a starter pack. I just started using Norwex last year and love it. The cleaning powder is awesome too! I think you get in starter kit, a cleaning cloth, a polishing cloth & dusting mitt. We live in an old house with a small front porch. I just wet my cleaning cloth & I can easily clean both sides of a 2 pane window without rewetting or rinsing out the cloth. I even did this after our long winter when they were dirty from not being cleaned since last fall. Feel free to email me if you have any other questions at judy.justusewater@gmail.com! I love the window cloth! I used it to get the build up of grease off my electric stove and it looked like new! Book a party and see it in action for yourself! Look for your local consultant here: http://www.norwex.com. The best part of doing a party with Norwex is you don’t have to clean your home before the party! Your consultant will LOVE you if you leave stuff for her to clean! My sister got some of these and brought them to my house this week to show me how well they work. They really do work great. Sharon they are only sold through independent sales consultants. I happen to be one. I would love to help you. Had never heard of these, sound too good to be true, but Crystal is recomending it, so they must be good. OR Book a party and see it in action for yourself! Look for your local consultant here: http://www.norwex.com. The best part of doing a party with Norwex is you don’t have to clean your home before the party! Your consultant will LOVE you if you leave stuff for her to clean! So glad I saw this before it was too late!! Would love to try these clothes … have heard nothing but great things about them and with my children’s allergies I think they would be ideal. Just having a hard time convincing myself and hubby they’re worth the money … trying them out may just convince us! !